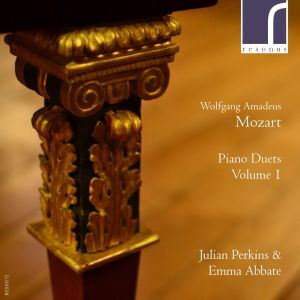 Following on their earlier volume of piano works for four hands by Wolfgang Amadeus Mozart, Julian Perkins and Emma Abbate here complete their survey. This recording is performed on two period instruments from the Richard Burnett Heritage Collection of early keyboard instruments – a grand fortepiano by Michael Rosenberger from c. 1800 and a square piano from the 1820s by London’s Clementi & Co.
Alongside the Sonatas in F major K497 and C major K19d, Robert D. Levin's completion of the fragmentary Allegro and Andante (Sonata) in G major K357 receives its first known recording. Also included is the Sonata in E-flat major by Mozart’s close contemporary Muzio Clementi. "One incomplete (finished by Robert Levin), two complete Mozart Sonatas and one by Clementi, all stylishly played on a Rosenberger fortepiano and Clementi & Co square piano." "Emma Abbate and Julian Perkins play with an excellent sense of consort, making it difficult to believe that there are two people playing." "The stylish, fluent performances maintain the high level attained in the first disc ... Such thoroughly rewarding and sympathetic playing." "Julian Perkins and Emma Abbate perfectly master all the technical and mechanical characteristics of the historical pianos used for these recordings, so that they are capable of achiving those peculiar suggestive tones and that peculiar warmth and softness and delicacy of sound ... The Mozartian interpretation given by the duo Perkins-Abbate can well be seen within that glorious tradition of a few great Mozart interpreters such as Edwin Fischer and Alicia de Larrocha ... This beautiful Series of CD Albums will make you appreciate, one more time, some beautiful masterpieces by Mozart, J.C. Bach and Clementi, from their very special convivial or Geselligkeit repertoire, and probably, thanks to the two brilliant interpreters and their fine choices, in the most authentic soirée atmosphere possible." Following on from her recording of Mario Castelnuovo-Tedesco’s Shakespeare Sonnets, Emma continues her series of landmark recordings dedicated to Italian twentieth-century vocal chamber music with this remarkable collection of songs by Ildebrando Pizzetti (1880-1968). Emma is joined in this fascinating journey through Pizzetti’s unique sound world by star mezzo-soprano Hanna Hipp in a programme covering half of his output for the genre. At times dark and intense, and with many moments of real beauty, these songs show a composer at the peak of his powers. 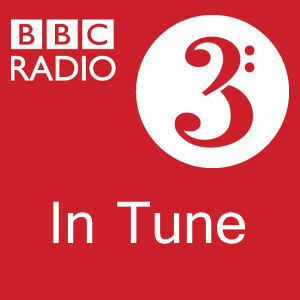 The disc has featured on BBC Radio 3. "Many of the songs are notably bleak or stark in mood: Hipp and Abbate deliver them with considerable intensity. Hipp's gleaming sound and declamatory fire impress in the anguished La madre al figlio lontano from Cinque Liriche, in which a mother waits in vain for her absent son's return. One admires her lyrical restraint in the sexually ambigous Passeggiata, which closes the same set, and the suggestive, but sparing way she uses her chest register in Scuote amore il mio cuore, a turbulent yet ravishing setting of Sappho. Abbate, meanwhile, breathes life into piano-writing that is frequently sparse but in which every shift of rhythm or colour speaks volumes." "Polish mezzo Hanna Hipp proves as comfortable in Italian song as she is in French opera (pace her excellent Anna to Joyce DiDonato's Dido in Les Troyens) while pianist Emma Abbate is a true partner, wonderfully flexible and entirely inside Pizzetti's tricky, densely populated accompaniments." "Hipp sings with tonal richness and real textual sensitivity – a vital matter in so text-conscious a composer as Pizzetti - and Abbatte is supremely alert whether the piano writing is spare and allusive or more generously forthcoming. This latest Resonus disc has certainly fulfilled its brief and its excellent notes prove suitably superior." 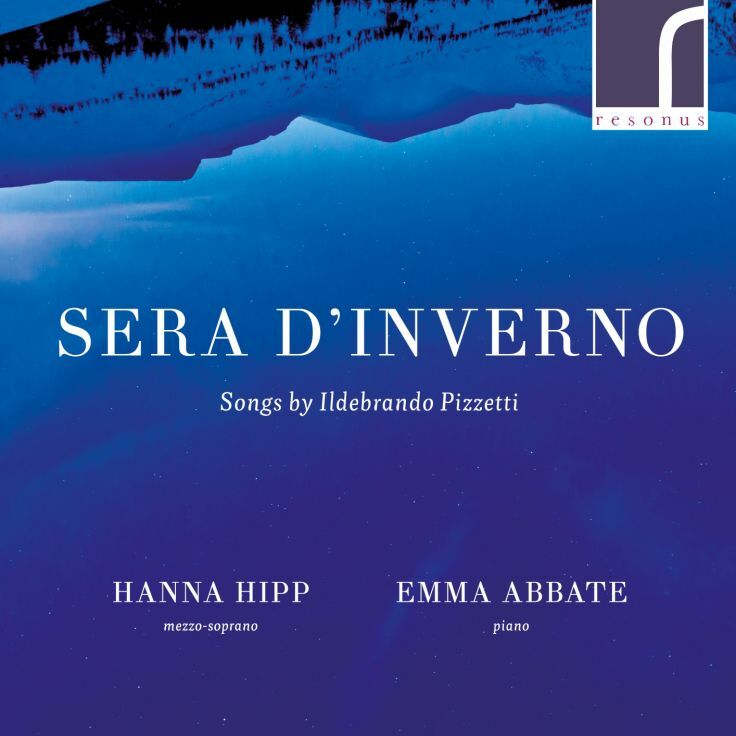 "Hanna Hipp sings with a lovely bright tone and a real radiance in the more passionate passages... Emma Abbate is a fine accompanist and partner, making Pizzetti's complex and sometimes dense piano parts work well... Here Hipp and Abbate make real music, the songs flow fluidly and have moments of great beauty and real radiance." "If the compositions are enhanced by their creator’s attention to detail, their interpretations are strengthened by the pianist’s assured command of his idiom. Abbate never puts a foot or finger wrong in her support of Hipp and Pizzetti." 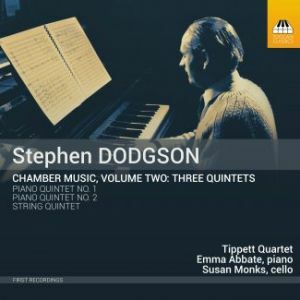 These three quintets by the London-born Stephen Dodgson (1924–2013) continue the exploration of his chamber music on Toccata Classics. Dodgson’s musical language inherited something of Shostakovich’s irony, Janáček’s spiky energy and Britten’s polished clarity, occasionally reaching further into the past in passages of Purcellian dignity, all animated with a gentle harmonic warmth of Dodgson’s own. The result, in a typically English paradox, manages to be both elusive and direct. The disc has been named a MusicWeb International Recording Of The Year 2017. "The performances by the Tippett Quartet and the nimble-fingered Emma Abbate in the Piano Quintets and Susan Monks as the additional cellist in the String Quintet are a model of chamber ensemble playing. Their understanding is palpable and the ensemble flawless, the effect one of total refiniment - just like Dodgson's music. The sound is superb, the recordings having been made in the church of St Silas the Martyr in Kentish Town. A truly wonderful disc and another winner from Toccata Classics." "...The performances are uniformly splendid... Let's hope there are many more such excellent discs before the centenary of Dodgson's birth in 2024." "...all the performances are absolutely splendid and quite beautifully recorded and balanced, with a pleasingly wide sound stage. The piano sound in particular is exemplary... Toccata can be proud of this generously-filled offering which is a very worthwhile and welcome addition to the discography of an unjustly neglected composer." "...I found it to be fun and adventurous listening. Much credit for the success of this must go to the performers. The Tippett Quartet, along with pianist Emma Abbate and second cellist Susan Monks, have delivered nigh unto perfect performances of this difficult music. The recorded sound is also exemplary in the CD-resolution download that I listened to. It is close-up and every musical texture is exposed without sacrificing ensemble blend. The church acoustic never obscures the instrumental details, but allows the ensemble just enough breathing room..."
The cello works of the London-born Stephen Dodgson (1924–2013) present his musical personality in a nutshell. The style is direct but rich in allusion, from Purcell to Janáček, with a lively, sometimes brittle, sense of humour adding a Shostakovichian irony, all fused together in an elegant, individual voice. And the remarkable clarity of the instrumental textures underlines a strong sense of narrative, with the cello almost as a human voice, unfolding its story with understated passion. "...The performances from Evva Mizerska and Emma Abbate are excellent, with the two demonstrating the sort of balanced partnership which the music presupposes. (A testament to their duo partnership Evva&Emma Duo which they formed in 2003). And both bring out the lyricism, fascination and challenge of Dodgson's music." 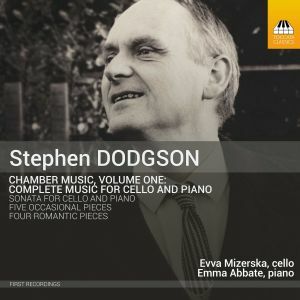 "Since Stephen Dodgson was fond of the medium of chamber music and as he wrote so well for the voice it’s not surprising that his cello works should be so infused with lyric-vocal qualities. The Cello Sonata of 1969 shows a fine conception of equals in a clearly structured three-movement work that reveals echoes of Bartókian Nocturne and a spare call-and-response between the instruments. There’s a certain refined introspection to Dodgson’s writing and an element of allusion but he doesn’t skimp the cello sonata’s voyage to a hard won (but not triumphalist) victory. The Five Occasional Pieces followed in 1970 and the composer himself instructed that they are for cello “with piano” and not therefore duo works. The second piece owes an acknowledged debt to Debussy whilst the fourth piece, an Aria, has long-breathed lyricism at its core – but with a colour-conscious role for the piano too – and hints of Eastern European keening in the cello’s song (not for nothing did Dodgson so much admire Janáček). His gift for vitality can be savoured in the Alla polka, here an ingenious and infectious swaying dance. There are four Romantic Pieces, divided into two sets of two through the disc, that expertly reveal the playful, lyric, and quintessentially Dodgsonian long romantic lines that mirror his gifts as a melodist of resourcefulness and warmth. The performances reflect those qualities too in the slightly enveloping acoustic of the Church of St John the Evangelist in Oxford. The booklet notes by John Warrack are in Toccata’s best tradition." "...The performances are more than good enough to suggest that Five Occasional Pieces, like the other works on the album, are the products of an original, highly distinctive, consistently surprising voice, making what is now the only collection devoted entirely to Dodgson’s music long overdue. 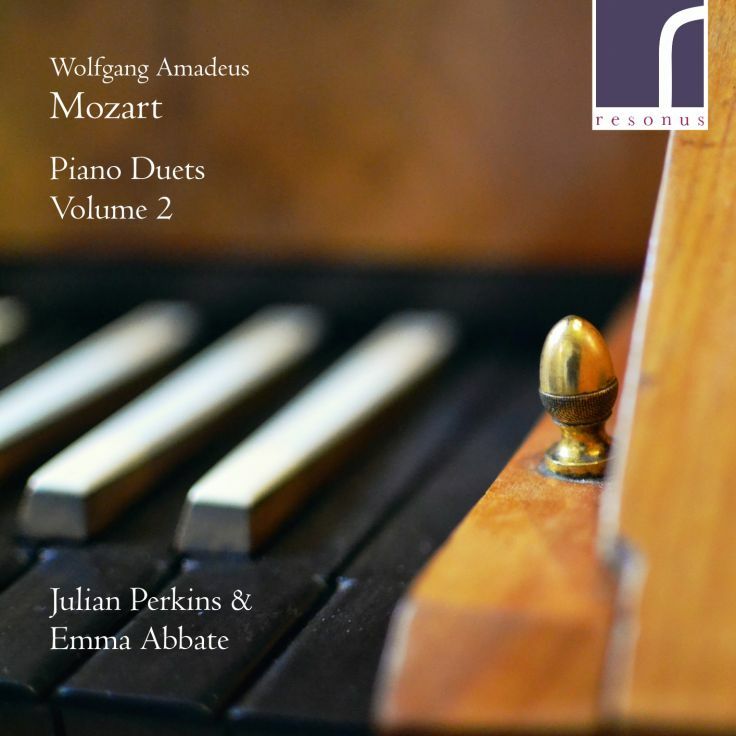 Emma Abbate and Julian Perkins have come together to record the first of two volumes of Mozart's complete piano duets on original fortepianos. Some of Mozart’s lesser-known works, his keyboard duets span most of his active life, with the earliest written at the age of nine. Often delightful and lyrical as well as humorous and exciting, these works are given an authentic air on period instruments. Included on this first volume are duets in D major K 381, C major K 521 and B-flat major, K 358. Also included is a duet by Johann Christian Bach, with whom the infant Mozart is alleged to have played keyboard duets whilst sitting on the older composer's lap. The two original instruments used on this recording form part of the Richard Burnett Heritage Collection of Early Keyboard Instruments: a grand fortepiano by Johann Fritz (Vienna, c1815) and a travelling piano by Anton Walter (Vienna, c1805). This album represents the final recording made at Finchcocks Musical Museum, and has also featured on BBC Radio 3. "Julian Perkins & Emma Abbate play with a delightful sense of the often playful quality of these pieces, reveling in the power and vitality of the faster Italianate movements as well as the gentler central slow movements, notably in the beautifully lyrical Adagio from the concluding Sonata in B-flat, played with impressive sensitivity. Their ability to play in perfect time together is exemplary – apart from the much richer sound of the pianos, it is difficult to appreciate that two people are playing, rather than just one. For an insight into the lesser-known side of Mozart’s playing and compositional life, this is thoroughly recommended. It is also a timely recognition of the work of Richard and Katrina Burnett over the past 45 years in creating such an important musical instrument museum at Finchcocks." "Successful piano duet playing places particular demands on the performers and here the two pianists are working very welll together. This is a programme of more substantive works written for this particular genre. As well as the Sonatas in C major, D major and B flat major, the programme also includes Johann Christoph Bach's two movements Sonata in A major. A second volume, also on period instruments, is to follow." "...excellent in all respects. The Fritz piano has full and gracious tonal qualities generously exploited by Julian Perkins (who plays primo throughout) and Emma Abbate, who especially relish exploiting the colours produced by the many imitative exchanges Mozart gives the players. Cantabile Mozartian lines are also beautifully drawn; listen for example to Perkins’ playing of the principal theme of the exquisitely lovely Adagio of K358, the kind of writing that would soon be finding its way into the central movements of the piano concertos. Both players are also untroubled by greater technical demands of K521, the big episode of the central Andante opening out to glorious blossom under the hands of Perkins and Abbate. The square piano on which the little J. C. Bach sonata is played is obviously a more modest instrument, but it has an attractively wheezy bass and the two-movement sonata, consisting of an Allegretto in the fashionable sentimental style and a breezy minuet, is ideal for this repertoire. It is worth adding that all repeats are taken, allowing the performers ample opportunity to add ornamentation, which is always tastefully and not infrequently wittily added. The sound is a little close, but very much in line with what I remember as ‘the Finchcocks sound’. I await volume 2 with considerable anticipation." Listen to samples at www.resonusclassics.com. 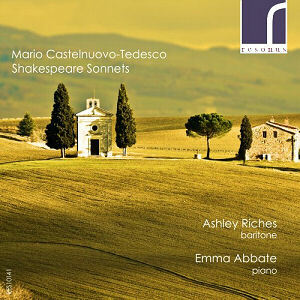 Live performance with baritone Ashley Riches: Weary with toil, I haste me to my bed from Shakespeare Sonnets by Mario Castelnuovo-Tedesco. Emma performs a ravishing selection of previously unrecorded Shakespeare Sonnets by Mario Castelnuovo-Tedesco with the BBC New Generation Artist Ashley Riches. Composed after Castelnuovo-Tedesco's migration to the USA in 1939, these songs contain both the wistful atmosphere and obvious warmth for his native Florence combined with his life-long obsession with William Shakespeare. "This fine collection of Shakespeare Sonnets is doubly welcome ... Baritone Ashley Riches is an ideal interpreter of this music, with a richness of timbre and a clarity of enunciation that is absolutely essential. He is sensitively accompanied by Emma Abbate. The recording, too, made in the church of St John the Evangelist in Oxford by Michael Ponder, is excellent, avoiding both excessive resonance and dryness." "... Superb performances ... Riches produces a lovely flexible yet firm line with gorgeous dark hints in the tone quality. He shapes Castelnuovo-Tedesco's sometimes diffuse vocal lines into things of really expressive beauty. Abbate is equally impressive, highly supportive of Riches in the richly chromatic piano part. [These pieces] are certainly well worth investigation, especially in such fine performances from a talented pair of young artists and this is a fine disc to dip into." "There is a very good partnership between singer and pianist in these performances, creating an easy and enjoyable listening experience." 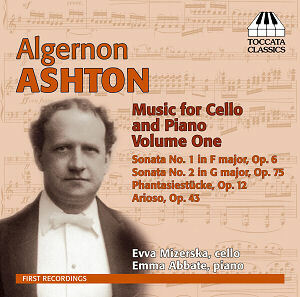 Emma's second CD with Toccata Classics is the world-première recording of works by Algernon Ashton with the cellist Evva Mizerska. Algernon Ashton, born in Durham in 1859, is one of British music's best-kept secrets, with a generous output of piano music, chamber works and songs. Rutland Boughton wrote that he 'seems to pour out great musical thought as easily as the lark trills its delight in cloudland'. Although Ashton’s writing for both cello and piano is taxing, what strikes the ear is the quality of his melodic inspiration – the lyrical immediacy of his tunes suggests Schubert, set in a style of Brahmsian richness. This CD is available from high street retailers and from Amazon, or directly from the Toccata Classics website. "... Polish cellist Evva Mizerska and Italian pianist Emma Abbate, known collectively as the Evva&Emma Duo, make a strong case for Ashton's music. [Ashton] was an accomplished pianist himself, and it shows in these challenging scores, which our artists handle with great aplomb. They have technical ability to spare, and their playing ranges from sensitively shaded in more melodic passages to virtuosically supercharged when the notes start flying thick and fast. Made at the Challow Park Studios in Oxfordshire, England, the recordings project a narrowly focused soundstage in a pleasing acoustic. ... both instruments are beautifully captured. The cello tone is rich and natural across its entire range. The piano is well rounded with no sign of any digital nasties ... this disc easily qualifies as an audiophile release." "... The two fine artists... the Polish born Evva Mizerska and the Naples born Emma Abbate play all of this music with great finesse. Ashton’s music is a revelation. It deserves a much wider audience than it has had so far. The sound on the disc is clear with each instrument given equal presence. I enjoyed getting to know Ashton’s story and his music and think this disc should have a place in many recording libraries." "... the positives with this disc are several. As one has grown to expect the production of this Toccata Classics disc is first rate. Excellent musical and technical values backed up by a liner of superb interest written by the ever insightful and dependable Malcolm MacDonald. [Evva Mizerska and Emma Abbate] ... are an established duo and play with great technical address and skill – indeed I cannot imagine a more convincing case being made for this music. ... the sound is rich and full with Ashton’s complex writing registering clearly and with maximum impact." A musical journey through 20th century Italian songs with the mezzo-soprano Kamelia Kader, including works by Respighi, Casella, Alfano, Malipiero, Pizzetti and Castelnuovo-Tedesco, many of which are world-première recordings. 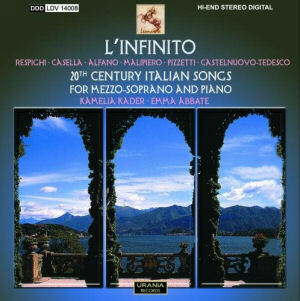 L’Infinito is available in downloadable MP3 format on Amazon and as a CD through the website of Urania Records. This disc explores an important era of Italian music that falls approximately between the two World Wars. It features liriche with texts by poets such as Petrarca, Leopardi and Carducci. Is this Italy’s answer to German lieder? "A carefully planned treasure-trove of fascinating repertoire, warmly recorded and sympathetically performed. ... [Kader] is a persuasive advocate for this very welcome project. Highlights include Casella’s ecstatic Pianto antico, a memorable masterpiece not unlike early Britten." "... Ascoltiamo nel disco Urania una pianista di strepitosa bravura, Emma Abbate ... Particolarmente prezioso appare ... il disco della Urania Leonardo per la scelta dei brani, con secidi prime incisioni assolute su ventiquattro brani: e si tratta quasi sempre di pagine di grande valore." 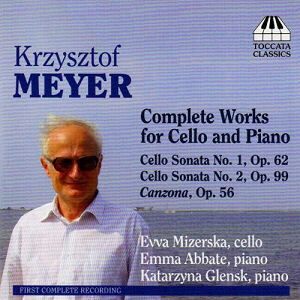 Emma’s first commercial CD was the world-première recording of complete works for cello and piano by the contemporary Polish composer Krzysztof Meyer, featuring Polish cellist Evva Mizerska and pianist Katarzyna Glensk. It was recorded in Warsaw in collaboration with the composer himself, and includes the première recording of his 2nd Sonata. The CD has been praised by The Strad magazine for its "great expressive range and impressive authority". It is available from high street retailers and Amazon, or directly from the Toccata Classics website. William Zagorski, one of the regular critics of American magazine Fanfare, has placed this CD in his “Top 5” list of all the CDs published worldwide in 2009. "The cellist, Evva Mizerska, seems to me, in my dotage, a mere child. She is, however, in possession of a fine, large-scaled, and infinitely plastic sound, able to encompass the challenging demands of Krzysztof Meyer’s thoughts with ease. Her two accompanists, Emma Abbate and Katarzyna Glensk, also quite young, navigate this difficult music with both utter commitment and facility. The sound is spotlessly clean in all registers, dynamically vast, and satisfying... These are stunning performances of stunning music.!" "These three young performers play these works as if they owned them, with complete assurance and clear dedication. Evva Mizerska produces a beautiful sound, no matter what Meyer asks of her, and Emma Abbate and Katarzyna Glensk leave a similarly attractive impression never mind that the piano parts are very challenging! ... This warmly yet transparently engineered CD whets one’s appetite for more." "The performances are excellent, and all the performers go all out to make this music really speak to us. The notes in the booklet are excellent and the recording is superb. I’ve said it before, but I shall repeat myself: Meyer is a major composer and he cannot be ignored. There are now sufficient CDs of his music available for us to be able to really discover him and his work. For me this is essential listening, and I would urge everyone who is interested in contemporary music to join me in discovering one of the most elemental and exciting composers currently at work today." "... great expressive range and impressive authority."